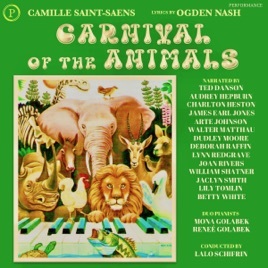 This star-studded rendition of Ogden Nash's humorous verses backed by a full-orchestra performance of Saint-Saens' Carnival of the Animals will surely delight adults and children of all ages. Performed by Ted Danson, Audrey Hepburn, Charlton Heston, James Earl Jones, Arte Johnson, Walter Matthau, Dudley Moore, Deborah Raffin, Lynn Redgrave, Joan Rivers, William Shatner, Jaclyn Smith, Lily Tomlin, and Betty White. Music performed by Mona Golabek and Renee Golabek. Conducted by Lalo Schifrin.